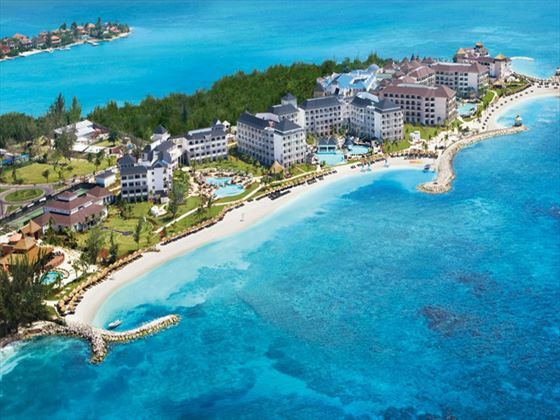 On the island that was once part of the British Empire, Secrets St. James Montego Bay sits on a peninsula surrounded by the crystal-clear Caribbean. This quiet oceanfront destination offers adults the ultimate in sophistication, relaxation, romance and the privileges of Unlimited-Luxury®. This beautiful adult only resort is just 20 minutes from the airport with nonstop transfers, and boasts 350 sophisticated décor suites with a king bed or two queen beds, sofa, fully equipped bathroom with whirlpool tub and separate shower. All mini bars will be refreshed daily with water, soda and beer. Suites have a private furnished balcony or patio. Choose from seven a la carte restaurants serving international cuisine (no reservations required), a buffet and a café as well as 24 hour room service. You can even have a romantic dinner on the beach. Top shelf spirits, international and domestic beers, and wine are served at eight bars and lounges – including a swim up bar and beach bar. Relax and enjoy wait service at the pool and the beach. Our regal 24 hour concierge service to help you with anything you need. Kick up the excitement with full access to adjacent Secrets Wild Orchid Montego Bay. Relax and soak up the sun at the beautiful sugar sand beach or at the two large sparkling pools and three outdoor Jacuzzis. From the moment you wake your days and nights are filled with nearly endless opportunities for relaxation or excitement. Explore the shops, restaurants and other attractions on the Promenade, work out in our state-of-the-art fitness center, take to the sea for windsurfing, kayaking or snorkeling. Tee off on some of the Caribbean’s most challenging championship golf courses (fee), or try your luck at the Gaming Lounge with poker, keno and other gaming machines (fee). Sports include pool volleyball, beach football, bocce ball, water polo, lawn croquet, a run on the jogging trail, bicycle tours, tennis on our well-lit court, water aerobics,, sailboats and kayaks, windsurfing and snorkeling, and introductory scuba lessons in the swimming pool. Enjoy the full service Secrets Spa by Pevonia where you can choose from an array of treatments to pamper your body. In the evening sit back and enjoy a live show in our open-air theatre or have fun at the themed parties or dance the night away to your favorite songs.